At the University of Pennsylvania, WXPN began as a student-run, campus-limited AM radio station in 1944 and gained its license as an FM station from the FCC in 1957. The station briefly lost its license in 1975 over an obscenity complaint. In 1986, WXPN repositioned itself to operate as a financially self-sufficient enterprise. Changes included hiring professional staff and initiating professionally-run fundraising drives. In addition to an eclectic mix of music, the station became known for innovative programming such as Kid’s Corner (begun in 1988), one of the country’s longest-running interactive children’s radio shows. The station also has been home to popular local DJs such as Michael Tearson, who began their careers there. During the 1990s, WXPN increased it listenership by adding a number of regional affiliates throughout Pennsylvania, Delaware, and New Jersey, and in 1991, the station debuted World Café, a showcase of cutting-edge and “world” music distributed nationally by NPR. 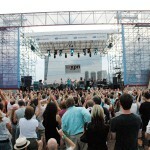 Since 2004, the station has sponsored an annual three-day music festival in Camden, New Jersey. In 2005, WXPN moved to a shared space within a 40,000-square-foot factory building at 3025 Walnut Street, hosting live music events inside a full-service restaurant and bar, as well as bigger concert events in a larger space that also offers dining service. Temple University’s radio station, WRTI, began as an AM station in 1948 and obtained an FM license in 1953. 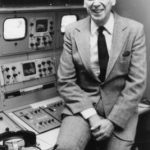 Founded by Temple professor and broadcast pioneer John Roberts as part of the School of Communication and Theater, WRTI began specializing in jazz in 1969. After a commercial station, WFLN, dropped its classical music format in 1997, WRTI partially filled that niche by moving from the all-jazz format to broadcasting classical music during the day and jazz in the evening. 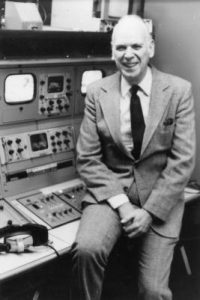 “Wider Horizons for You and Yours,” better known as WHYY, was founded as an educational radio station in 1954 by a partnership of community leaders including W. Laurence LePage, president of the Franklin Institute. In 1957, WHYY moved into television programming. This photograph from that year depicts chief engineer Samuel Barbour (left) showing LePage one of the station’s new studio cameras. 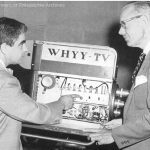 WHYY-TV programming was broadcast from studios in Philadelphia on UHF-Channel 35 until 1963, when the station received a VHF license from the FCC and began broadcasting on Channel 12. 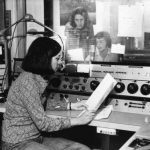 Over the last decade of the twentieth century and into the twenty-first, WXPN-FM, at the University of Pennsylvania, made a name for itself as an innovative alternative radio station. In 1991, for example, the station debuted World Café, a showcase of cutting-edge and “world” music distributed by National Public Radio (NPR). 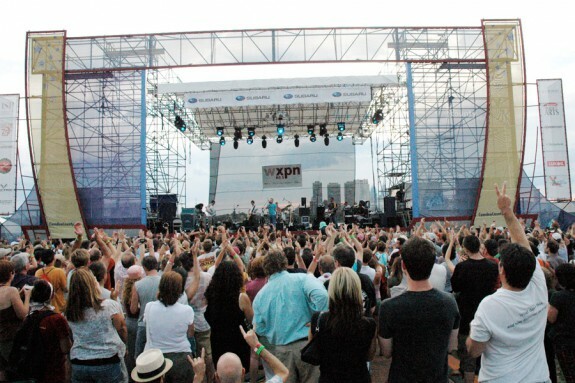 In 2004, the station held its first XPoNential Festival. Pictured here in 2014, the three-day festival is staged in riverfront Wiggins Park, in Camden, New Jersey, across the Delaware River from Philadelphia, and features nationally-known musical acts as well as local groups and family-friendly activities. (Photograph by M. Kennedy). Philadelphia participated early and actively in the founding and development of public broadcasting, which expanded across the twentieth century to encompass radio, television, and digital platforms. Public media organizations have given voice to local concerns, provided forums for diverse opinions, and offered programming not found in commercial broadcasting. Precedents for public broadcasting originated in the United States in the form of noncommercial educational radio stations in the early days of broadcasting. During the 1920s and 1930s radio became America’s dominant media for entertainment and the instantaneous transmission of news. However, the Great Depression decimated stations run by educational and academic institutions, and by 1933 seventy-five percent of educational stations had ceased broadcasting. Financial problems also plagued educational television stations. In 1938, the Federal Communications Commission (FCC) began reserving a spectrum of channels for noncommercial educational use. By 1952, 242 such stations existed in the United States, but by 1959 the number declined to forty-three. Three of Philadelphia’s public media outlets had their origins in this era, two with the benefit of support by local universities. At the University of Pennsylvania, WXPN began as a student-run, campus-limited AM radio station in 1945 and gained its license as an FM station from the FCC in 1957. Temple University began its campus-limited AM station in 1948 with call letters indicative of the station’s mission: WRTI, for “Radio Technical Institute.” The FCC licensed WRTI as an FM station in 1953. In 1954 the region also gained WHYY (“Wider Horizons for You and Yours,” an educational radio station founded by a partnership of community leaders including Dr. W. Laurence LePage (1902–85), president of the Franklin Institute. 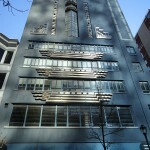 Westinghouse Radio stations donated a studio for WHYY in the Architect’s Building at Seventeenth and Sansom Streets. 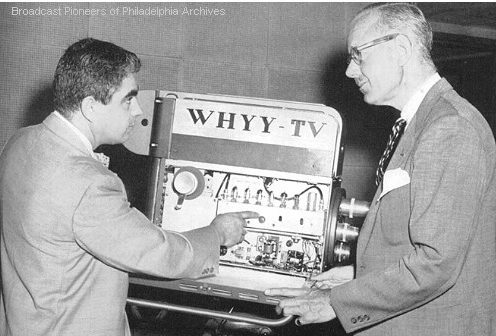 WHYY moved into television programming in 1957, broadcasting on an educational station, UHF-Channel 35, which operated under the auspices of the School District of Philadelphia. 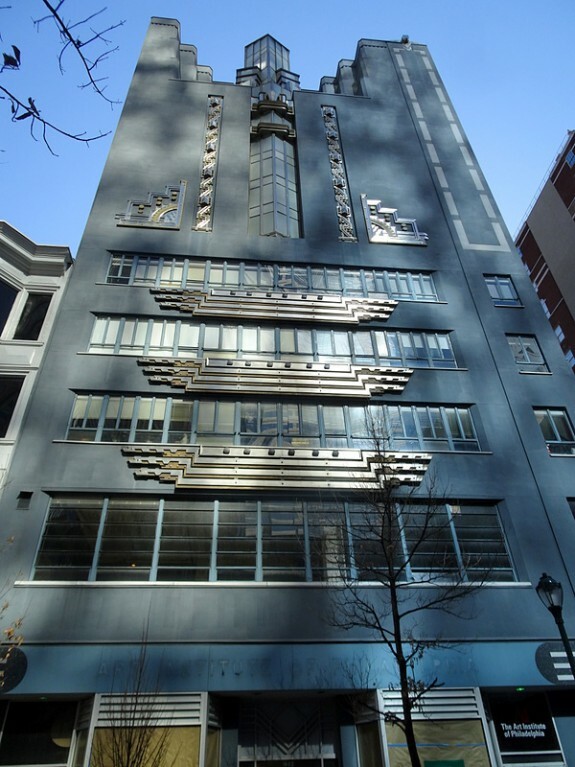 With support from the city’s cultural and educational institutions, WHYY broadcast news and arts programming from studios at 1622 Chestnut Street—a renowned Art Deco building formerly home to WCAU (later occupied by the Art Institute of Philadelphia). The opportunity to move to Channel 12 on the VHF television dial emerged in 1963 when a VHF license became available in nearby Delaware. WHYY sought and obtained the license from the FCC, then began broadcasting a local news program from a studio in Wilmington at Fifth and Wood Streets. While maintaining this foothold in Delaware, the station subsequently moved into WFIL-TV’s former station facility at Forty-Sixth and Market Streets, donated by media magnate Walter Annenberg (1908-2002). While generally acknowledged as a public good, educational radio and television consistently struggled for funding. Public broadcasting did not become viable as a national system until 1967 with passage of the Public Broadcasting Act. Promoted by President Lyndon Johnson (1908-73) as part of his Great Society program to relieve poverty, provide educational opportunities, and address racial inequalities, the Public Broadcasting Act established the Corporation for Public Broadcasting and charged it with founding the Public Broadcasting Service (PBS, established in 1969) and National Public Radio (NPR, 1970). An earlier public television network, National Educational Television (NET) merged with PBS in 1970. With support from the federal government, these entities became the cornerstones for public broadcasting throughout the United States. 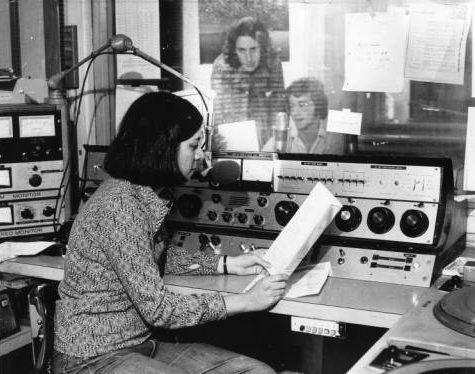 WHYY became one of the first charter members of the National Public Radio network in 1970. While broadcasting primarily classical music, and some of its locally produced shows began to reach nationwide audiences, including “Fresh Air” (inaugurated in 1975) with Terry Gross (b. 1951) and “Voices in the Family” (which premiered in 1985) with Dan Gottlieb (b. 1946). In 1979, WHYY moved to Sixth Street near Independence Mall, occupying the former the Living History Center, a museum built for the Bicentennial that had gone bankrupt in 1978. The City of Philadelphia leased the building to the station for a dollar a year. The question of whether the federal government should fund public broadcasting spurred debate by the early 1970s, followed by major cuts during the administration of President Ronald Reagan (1911-2004) in response to conservative allegations of the network’s supposed liberal bias. During this era, the 1980s and 1990s, the region’s public radio stations altered their formats as they searched for expanded audiences and greater sustainability. In 1987, WHYY dropped classical music and transitioned into a mainstay for reporting and commentary on news and the arts. After a commercial station, WFLN, also dropped its classical music format in 1997, Temple’s WRTI partially filled that niche by moving from the all-jazz format it had followed since 1969 to broadcasting classical music during the day and jazz in the evening. At the University of Pennsylvania, from the start WXPN had featured an eclectic mix of musical genres. In 1986 the station repositioned itself to operate as a financially self-sufficient enterprise. Changes included hiring professional staff and initiating professionally-run fundraising drives. The station became known for innovative programming such as Kid’s Corner (begun in 1988), one of the country’s longest-running interactive children’s radio shows, and World Café (debuted in 1991), a showcase of cutting-edge and “world” music distributed by NPR. All three stations developed networks of regional affiliates. During the 1980s, WRTI expanded its audience to affiliates in northeast and central Pennsylvania well as New York, New Jersey, Delaware, and Maryland. During the 1990s WXPN also increased it listenership by adding a number of regional affiliates throughout Pennsylvania, Delaware, and New Jersey. WHYY television, in addition to its locations in Wilmington and Philadelphia, added WDPB-Channel 64 (Seaford, Delaware) as an affiliate broadcasting in southern Delaware. The public media landscape also shifted in 2011, after New Jersey Governor Chris Christie (b. 1962) directed the dismantling of NJN (the state’s public television and radio network). While public broadcasting stations in New York bought NJN stations in North Jersey, WHYY acquired WNJS (Berlin), WNJB (Bridgeton), WNJN (Atlantic City), WNJM (Manahawkin), and WNJZ (Cape May Court House). The region’s public broadcasters augmented their original productions from a national array of sources. For radio, in addition to NPR these included Public Radio Exchange (a nonprofit content provider headquartered in Cambridge, Massachusetts), Public Radio International (Minneapolis, Minnesota, whose parent company is WGBH, Boston), and American Public Media a nonprofit headquartered in St. Paul, Minnesota). For television, in addition to PBS, sources of programming included American Public Television, the Independent Television Service, and the National Educational Telecommunication Association. With the advent of computer technology, podcasting, and digital radio, public broadcasting became “public media,” with new vehicles for delivering programming and new models for economic viability and relevance. Public radio, including Philadelphia’s WHYY, embraced new media to publicize and distribute content and to reach a younger audience. In 2000, WHYY opened its Technology Center and Independence Foundation Civic Space to encourage civic participation with the station’s media content. In 2010, continuing to extending its reach beyond broadcasting, WHYY opened the Dorrance H. Hamilton Public Media Commons to promote digital skills and digital media production for the region’s residents, including students and teachers. WHYY also launched two websites, WHYY.org and NewsWorks.org, the station’s multi-platform information service. Vibiana Bowman Cvetkovic is a reference librarian at the Paul Robeson Library of Rutgers – The State University of New Jersey. Boris, Alan. Philadelphia Radio. Charleston, S.C.: Arcadia Publishing, 2011. Engleman, Ralph. Public Radio and Television in America: A Political History. Thousand Oaks, Calif.: Sage Publications, 1996. Mayer, Martin. “Whatever Became Of Educational Television?” Change 4.2 (1972): 48. McCauley, Michael P. NPR: The Trials and Triumphs of National Public Radio. New York: Columbia University Press, 2005. Ruben, Marina Koestler. “Radio Activity: The 100th Anniversary of Public Broadcasting.” Smithsonian.com. January 26, 2010. Shull, Bill. Philadelphia Television. Charleston, S.C.: Arcadia Publishing, 2015. Guide to Television Studies, Annenberg School of Communications Library, University of Pennsylvania, Philadelphia. Public and Educational Broadcasting Archive, Hornbake Library North, University of Maryland, College Park, Md. Urban Archives, Special Collections Research Center, Paley Library, 1210 Polett Walk, Temple University, Philadelphia. WHYY, Delaware Broadcasting Center, 625 Orange Street, Wilmington, Del. WKDU, 3210 Chestnut St, Philadelphia. WRTI, 509 Cecil B. Moore Avenue, Philadelphia. WXPN, 3025 Walnut Street, Philadelphia.